I was up at 3am that morning, and not okay playing these games. We found the guy that gave us our initial quote and received the promised fare. The hour-long drive down the mountain in the daylight was beautiful. Arriving back in town, the minibus parked near the bus terminal. Since we were hopeful to take the train for part of our next journey, we needed to find the train station. Our drivers were very helpful, telling us how much to expect to pay (4,000 Rupiah each), and tracking down the yellow key public minibus for a cheap ride. Upon arrival at the train station, the driver of this public bus tried to charge us 10,000 Rupiah each. I pointed to the sign in the bus that had the quoted fare (4,000 for non-Indonesians) on the window, and he rolled his eyes in disgust. We handed him a 10,000 Rupiah bill, expecting 2,000 back, paying for both of us. I indicated I wanted change and he said ‘no’ and took off. 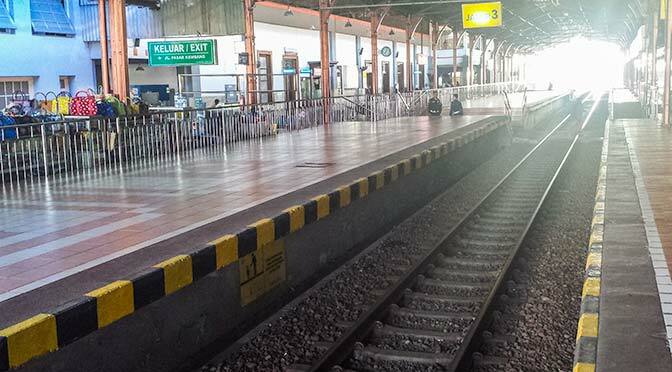 We were greatly anticipating taking the train for part of our trip to Bali, where there are set fees, air-conditioning, and room to stretch out. We found out that the train didn’t leave for another four hours. Disheartened, we decided to settle for the public bus, and continue our journey without further delay. This should have been another straight-forward, cheap, easy, overland trip. Instead of taking the train for the first leg, we would now try taking the bus to catch the ferry, then one more minibus bus to our final destination. We exited the train station, walked past and ignored the few touts waiting outside, and got back on the yellow key minibus going back to the bus terminal. On the way to the bus terminal, the driver stopped at a tour agency, where his friend came over to try to get us off the bus and sell us another package. Once the driver realized we were not getting off his bus, he reluctantly continued on to the actual terminal. Upon departing from the bus, this driver quoted us only slightly higher prices. We again did not have exact change, but after he realized that we knew what the actual prices were supposed to be, he gave me a devious smile and the correct change. At the bus terminal, we asked around for the public transport ticket office or information center. We were immediately helped and guided inside the building. We quickly realized once they quoted us the ticket fares, that we blindly followed someone most likely getting commission, into another tour agency. Leaving the building, we walked outside and found the public buses. Unlike the train station, bus terminals do not have an actual ticketing office. The bus ticket is given and paid for on the actual bus. They have signs on the front of each bus indicating their destination. The concept is so easy and simple, yet the execution was close to impossible. If our backpacks did not give us away already, being the only two white-skinned, blond-haired people in a three-block radius did. As soon as we started toward the buses, we were swarmed by seemingly friendly men. I cannot even begin to describe the frustrating experience that ensued. I did research prior, so I knew the cost of the bus ticket, the destination city, the time it would take on the bus, and the fact that a bus leaves every hour. We now knew the method of finding the bus, getting on, and then paying. It didn’t matter what we knew, as everyone around the buses started quoting crazy high prices for these simple public buses. As soon as we found the bus we needed, and tried to buy a ticket, the bus driver would go along with what these men were trying to quote us. We were there for thirty minutes hearing so many different stories of prices, buses, times, etc. We were told everything you could possibly imagine, to the point where I was starting to doubt what I thought I knew. It was at this time that an angel appeared. A young, beautiful Indonesian girl came over and helped us. She told us to not listen to these men and pointed to a bus for us to get on. It was a breath of fresh air, as we needed to be reassured that our facts were true. We approached the bus that she pointed out, and attempted to talk to the driver. The driver’s English was rough, and as soon as another tout came over quoting crazy high prices and talking in Indonesian to the bus driver, he stopped talking to us. We were about to give up, completely beaten, and wait for the train, until I made one last attempt at talking to a young Indonesian man. He just arrived near our bus and was heading to the same place we were. As soon as I started talking with him, all the touts left. We followed him onto the bus, and the driver agreed to the basic fare price. It was seriously a miracle. This young man was incredibly nice and helpful. The entire rest of the bus ride we were left alone, which is a big deal when we were the only white travelers taking the public transportation. It was a long, bumpy, hot, non-air-conditioned, four-hour bus ride to the east coast of Java. We literally followed our new friend off the bus and onto a shared minibus to take a short ride to the pier to catch the ferry to Bali. After getting dropped off, the driver again tried to charge us more than everyone else, and more than what we agreed upon previously. This young stranger somehow talked them into taking the honest fare and they drove off. We may have seemed like stalkers now, as we followed our new friend onto the ferry. I was so grateful for his generosity with helping a few struggling foreigners. We arrived on the West coast of Bali around 8pm after the hour-long ferry ride and added hour due to the time change. Our friend made a few phone calls to see if there were any buses running this late to bring us to Bali’s main city, Denpasar. As soon as we walked off the ferry, his friend found us and brought us to the waiting area. We had to wait thirty minutes or so, and in the mean time had more taxi drivers trying to persuade us to use their modes of transportation. Ignoring those crazy prices, we waited to board the public bus. It was another three hours to get from the pier on the West side of Bali to the bus terminal on the East side. On the bus we met two young German girls who booked their transportation through the tour agency, and had been on that same bus for over ten hours already. We were now the only four white travelers on board. It was nearly midnight when we arrived at the bus terminal. We agreed to share a minibus with the German girls and head straight to a home stay only thirty minutes away. As soon as we stepped foot off the bus, we were greeted by more touts, never ending touts. The first one that approached the German girls pretended not to understand the question “how much”? He just seemed friendly and kept saying “I show transport, I show transport”, until he had brought us clear away from all the other drivers. At this time of night, I was done dealing with non-sense. I stopped following him and did not move until he came back and gave me a price. He quoted us each a price that was almost as much as we paid for our entire transportation up to this point. I started to walk away, saying too much, to find another driver. He was starting to back pedal now, realizing he was losing his only business for the night. He immediately cut his price in half, and kept trying to persuade with different prices. I threw out a number I was willing to pay. He immediately accepted, and proceeded to walk us to his minibus. As soon as we were far away from everyone else, and started to load our bags into his minibus, he increased his price. He said we either pay more now or wait for others to fill the bus. Since no other big buses were coming for the night, this was a ridiculous offer. I had been up since 3am, it had been a very long day, and I was getting really irritated. His increase was literally a few mere dollars, but solely on principle, I wanted to punch him in the face. After failing to convince him that he could not accept a price and then change it, we finally gave in because we were all too tired to care anymore. Thirty minutes later we arrived at our homestay and crashed for the night. I honestly don’t know if doing this trip ourselves was worth all the hassle. Being crammed on a non-airconditioned, small, minibus for fifteen hours straight and paying triple, might have been worth it. The best method would have been to plan well in advance, purchase a cheap flight, and truly avoid the character-building travel day all together.